FHA loans have long been one of the most popular mortgage types available. Four important new guidelines that home buyers should review for FHA loans in 2018. 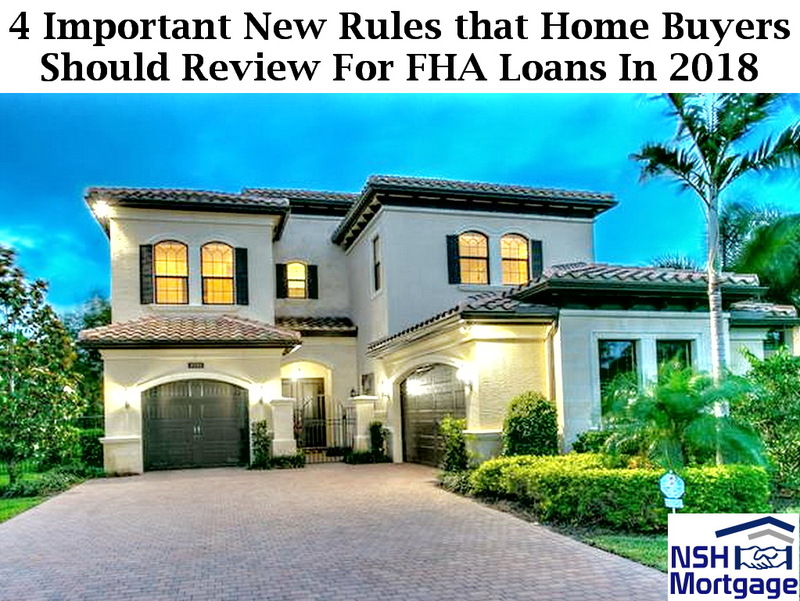 NSH Mortgage has the knowledge and tools that can help you investigate how much these new rules for FHA Loans can help you out. Roughly 20% of all mortgage applicants will opt for a FHA loan because of its buyer friendly guidelines according to mortgage software company Ellie Mae. FHA was designed to help home shoppers with lower credit scores and a small amount of cash in the bank. The busy spring home buying season is beginning, and mortgage rates have been near their lowest levels in years. FHA remains the right choice for many home buyers. Thanks to recent policy changes within FHA, lenders could start approving more loans. Buyers could have a much easier time purchasing a home, and applicants who were previously turned down could receive a FHA mortgage approval in 2018. The Federal Housing Administration (FHA) is a government agency that insures home loans. However, the FHA does not actually lend any money, this responsibility is left to banks and non-bank lenders like mortgage brokers. The agency insures the loans which in turn allows lenders to issue approvals with low down payments and less than perfect credit scores. But FHA will only insure a loan if it meets its standards. Lenders approve loans imperfectly, sometimes missing the mark when it comes to FHA guidelines. Minor errors and mistakes make their way through the loan process. Sometimes, borrowers and other third parties intentionally commit fraud, unbeknownst to the lender. Lenders can take a serious financial hit because of these mistakes. FHA can require the lender to absorb the financial loss that FHA was supposed to insure against. The uncertainty has made lenders hesitant to approve credit-worthy FHA home buyers. This is an unintended consequence for FHA. The organization’s mandate is to increase home-ownership levels in the U.S. But loan refusals were the real world effect, as lenders feared high penalties for mistakes. To combat this, the FHA announced that it would not penalize lenders when loans went through with minor mistakes that had no bearing on loan approval. This takes a lot of pressure off of lenders. FHA’s goal is to help lenders become more willing to approve home buyers for FHA loans. In addition, it is because FHA as an agency is becoming less strict, lenders may be more eager to approve FHA loan applications. FHA’s new policy will benefit home buyers this year, but indirectly. Lenders should become more lenient as they experience less scrutiny from FHA. In turn, mortgage banks and brokers could relax lending standards and approve more FHA buyers in 2018. This should further increase access to FHA loans for the typical home buyer, in line with FHA’s core mission. FHA, from its inception in 1934, has maintained lenient lending standards; their goal is to promote home-ownership among a population that would not qualify for other types of financing. Guidelines are so lenient, in fact, it makes it easier for lenders to usually set their own FHA lending standards that are much more strict. These additional lender rules are called POST. For example, FHA may allow the borrower to qualify with income received for less than two years. A lender can overlay a requirement that the borrower needs to be employed a full two years before approving the loan. By the book FHA guidelines would result in an approval. Lender create overlays to reduce risk that their loans will be subject to FHA penalties. Overlays will not go away. But they could be diminished enough for a subset of borrowers to be approved. Even if they received a denial in the past. FHA loans will continue to be a favorite among first-time home buyers. While the program is well used by new buyers, applicants also use it to make a subsequent home purchase due to a move or after outgrowing their first home. One advantage with a FHA loan is how lenient they can be on their credit score requirements. Technically, a credit score of just 500 is required to get approved for a FHA loan, but lenders will likely require a minimum score between 580 and 640. Still, this is one of the lowest required scores among mortgage options. Another draw to the FHA loan is its low required down payment. As little as 3.5% down is required at closing. FHA loans also tend to offer some of the lowest mortgage rates available. According to Ellie Mae, average mortgage rates on FHA loans are between 10 and 15 basis points (0.10% – 0.15%) lower than average rates on conventional loans. FHA loans provide an unique set of benefits that are a perfect fit for a sizable portion of today’s home buyers.